Scots FOI Chief rejects calls for honesty over lack of powers to deal with inaccurate data from public bodies. APPEARING to reject calls for new ‘honesty powers’ to deal with Scots public authorities who provide dishonest or inaccurate data in response to Freedom of Information requests, Scottish Information Commissioner Rosemary Agnew has claimed Scotland’s FOI system is "open, transparent and honest" – even though evidence & case examples suggest public authorities are releasing dodgy data in an attempt to avoid public scrutiny of their activities. The Scottish Information Commissioner made the claims to MSPs during her appearance on 6 May at the Scottish Parliament’s Public Petitions Committee where msps considered proposals to give the Commissioner new powers to deal with dishonest public bodies, contained in Petition PE1512 Amendments to the Freedom of Information Scotland Act 2002 filed by retired Scotsman journalist Mr William Chisholm. The petition calls on the Scottish Parliament to urge the Scottish Government to strengthen the Freedom of Information (Scotland) Act 202 by requiring public bodies to provide full and accurate information in all responses to FOI requesters, and to extend the powers of the Scottish Information Commissioner (SIC) to enable the Commissioner to investigate complaints alleging erroneous responses. The petition also seeks powers to impose monetary penalties on any public body which breaches the amended FOISA regulations on accuracy. 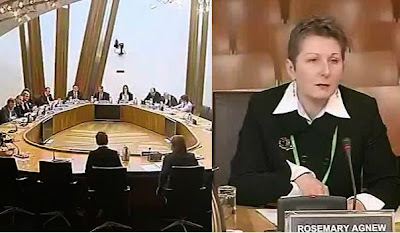 Giving evidence to MSPs, Ms Agnew appeared to suggest a variety of reasons could lead to the information being requested not being released, such as public bodies not searching for the information in the correct place, inaccuracies in public records, or the information not being held by the public body. The Commissioner went on to tell the Committee tthe most effective way to deal with FOIs was "getting it right first time" - although many FOI requesters including some msps who use Freedom of Information to find out what Scottish public authorities are really up to, may find Ms Agnew’s claim on this point hard to swallow. Concerns have also been raised over the Information Commissioner’s policy towards public authorities who provide dodgy information in response to FOI requests after it emerged in responses to the petition that not one single prosecution of a public body breaching FOI laws has taken place – even though the Information Commissioner and Police Scotland identified 10 cases where there was evidence that suggested a section 65 offence may have been committed. Concluding the debate. the Committee agreed to defer consideration of the petition to a future meeting to allow time for the Scottish Government to respond and to enable the petitioner to comment on evidence received. Disclosures obtained under Freedom of Information legislation and forwarded to Scottish Law Reporter have revealed how the Scottish Information Commissioner held discussions on how to respond to queries from the Scottish Parliament’s Petitions Committee on calls to integrate honesty clauses into the FOI Act. 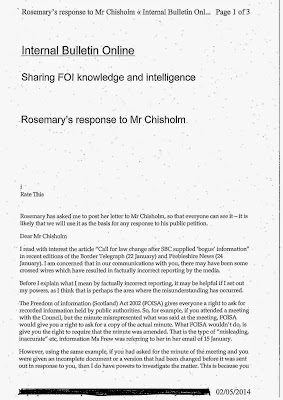 Commenting on the documents earlier today, transparency campaigners described the SIC’s efforts to wind up Mr Chisholm’s petition as “outrageous”. How can a wolf in sheeps clothing be trusted to guard the chicken coup from the foxes?